Funds from this grant were used to develop a website devoted to marketing of alternative crops. This project has gotten the attention of the Henderson County Manager and Commissioners. As a result the initiative became part of the Henderson County 2020 plan for agriculture. Although fewer than 20 growers have joined the site, reviews and interest continue to grow. It is expected that additional work and education programs will be needed to continue the project. Initial plans were to have a complementary paper directory as well. These plans are still being processed and a hard-copy directory will be printed in the Spring of ’05. Several growers in Henderson and Transylvania Counties have adopted alternative crops and cropping systems. While producing these specialty crops have their on unique production techniques; learning these techniques has been relatively easy for most growers. However, developing marketing strategies and venues has been the biggest hurdle for most specialty crop producers to master. This grant proposal is designed to assist these growers in examining as well as adopting new methods of marketing in order to increase their profitability and sustainability. Specialty Crop Producers will be identified and loosely organized based on similarity of crops. Two or more similar groups will be assisted in developing collaborative marketing efforts through the initiation of both web-based marketing and brochure development. 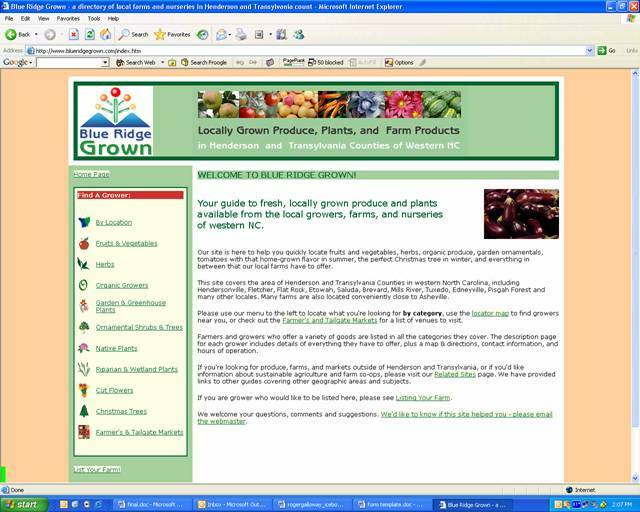 Grant funds will be used to provide initial “seed money” to support a basic website devoted to marketing of alternative crops in WNC as well as to help produce quality brochures devoted to group marketing of the selected commodities/systems. Individual growers will be asked to make small contributions to the costs initially incurred and provided with direction to increase their contributions to cover recurring expenses after the grant funding time has expired. Educational programs designed to assist these growers with presentation and displaying techniques at trade shows and retail venues will also be implemented.